The CARE-Diageo partnership aims to deliver transformational change in CARE communities throughout the Diageo value chain. Together we aspire to empower women and engage men to address the root causes of gender inequality through research, programming and advocacy activities. At every stage of the value chain there are different opportunities available to men and women and different barriers to overcome on a daily basis. Women are disproportionately disadvantaged throughout these experiences, whether they are smallholder farmers, workers in the hospitality industry or consumers buying products at the end of the value chain. Gender-based violence is a symptom and a cause of this gender inequality; violence against women occurs because of unequal power between men and women and it stops women from fulfilling their potential within the value chain. This is because violence – and the threat of it – stops women’s freedom of movement, education and access to opportunities. 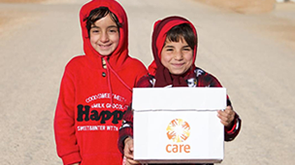 At CARE we know that we cannot overcome poverty until all people have equal rights and opportunities. Through our partnership with Diageo we are therefore contributing to reaching CARE’s global goal of economically empowering 30 million women by 2020; securing equal access and control over economic resources for women and ensuring that all women live a life free from violence. Still in its early stages, the CARE-Diageo partnership is currently building on the strength of both partners on a global scale to tackle gender inequality. By taking an end-to-end value chain approach the partnership is scoping initiatives which are firmly rooted in the needs of the women who Diageo interacts with throughout its daily operations. Within the agricultural supply chain, for example, the partnership is analysing the experiences of smallholder barley farmers in Ethiopia from a gendered perspective. In South East Asia, programmes and research are focusing on the hospitality environment and tackling sexual harassment for beer sellers and workers in the tourism industry. And at the point of contact with consumers, we are starting to explore how Diageo brands might influence public perceptions of gender and how we can harness the power of public campaigns to make positive change to these perceptions.